No, we're not selling the Great Apartment, but we are trying to sell the Great Apartment. Got it? 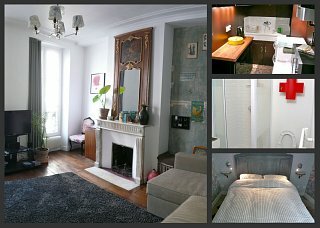 What I mean is, when we first bought, renovated and starting renting the apartment, we never really thought about how people would find it on the web, and choose us rather than one of the thousands of other places available in Paris. We did know that we wanted to do something different from the hundreds of apartments we had seen with creaky sofabeds, pine furniture and rank kitchens. And we also thought that the blog would bring people our way a bit. However, we soon realised that being different from the rest was simply not enough. There are so many apartments and so many agencies out there, that the chances of someone coming across our site are small. I have the same problem when trying to find a decent independently-run apartment when I go abroad; there's just so much 'noise' from the agencies that you can't find them. It's frustrating. This is why we put our apartments on Flipkey. 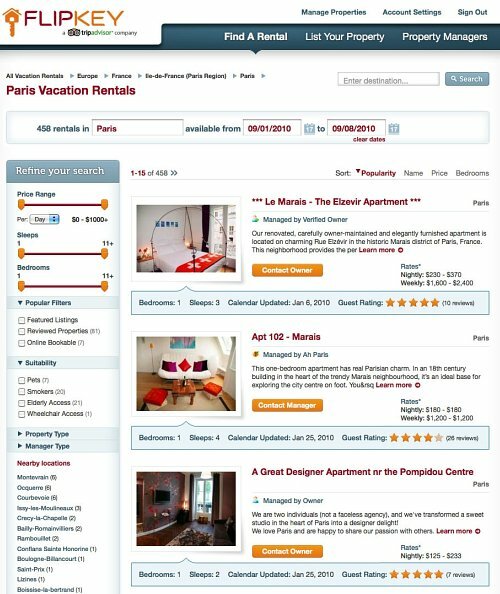 Flipkey is the sister site of TripAdvisor, probably the most trusted way to find a decent hotel anywhere in the world. The site lists only apartments and allows past guests to review them so that others can make an informed choice. Of course the problem of too much choice applies here too: if you do a search for - say - a Paris apartment for a week in September, there are 458 apartments listed! It's important to be at the top of that list so as not to get completely lost. And this is where our guests can help out. The apartment's position on the page is dictated by the quality of the listing (number of photos, etc. ), the number of reviews and the ratings given. Which is why you'll probably receive an e-mail from Flipkey after your stay, asking for you to write a few lines about the Great Apartment. A mailout via the Flipkey site last week got us quite a few reviews for Great Apartment and the Canal Apartment, helping the latter to get to 14th place (still on the first page, quite a feat with 458 apartments on offer) and the former to 3rd place! We were so pleased! And grateful! And I can't emphasize enough: writing a review on Flipkey is probably the nicest thing you can do for us. It helps people really know what the apartment is like, helps us pick up on anything that could be improved (I've already changed a couple of things at the apartment thanks to reviews) and makes sure that people can find us on the site. And of course, that helps us to keep the Great Apartment a going concern and help people have an unforgettable stay in Paris. Of course our position on the page will change all the time. We only show up if the apartment is available for the dates requested (logical), and the people above and below us will also be getting more reviews, so it's an ongoing process. The Canal Apartment is probably 14th because it's new and hasn't got as many reviews (although I'll be reminding people soon to help us out!) but having both apartments on the first page, even for a while, is really encouraging, and we're super grateful, especially as there are loads of nice things being said! We've also integrated a Flipkey widget in the right-hand column of our site. That way, people can click and read what people have to say about us. I think it's quite a useful tool for people. Thanks again to everyone who took the time to write a review. It's very much appreciated.